So um, there’s this um, competition thing happening over at Kidz World at the moment and I um, would really like to get all up in that business. Look, I know this is probably the 100th post along these lines that you’ve read in the last couple of days, so I’m not going to sugar coat it. On the one hand I know that there are 100’s of other awesome Mommy Bloggers out there in our South African land, but on the other hand, I work damn hard at all of these posts and you guys seem to come back and read them all. So there’s that. 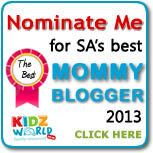 Apparently there is sometimes a problem with the site (probably all the people trying to nominate us and stuff), so if you are struggling to get there through this button, you can also go directly to http://www.kidzworld.co.za then click on the competitions tab at the top, scroll down to the Mommy Blogger nominations and then complete the little form there – our Website address is http://www.alfinos.wordpress.com (in case you are viewing the site through a blog viewer and can’t see it). Cindy there seems to be a problem with the site, when i click it comes up as a URL message. check it out please..
It’s working when I click on it which is weird, but if you go directly to http://www.kidzworld.co.za then click on the competitions tab at the top, scroll down to the Mommy Blogger nominations and then complete the little form there – our Website address is http://www.alfinos.wordpress.com (in case you are viewing the site through a blog viewer and can’t see it). i eventually got it working but still check it out.